Nothing beats a good burger! Mix and match your favorite burger flavors with these 7 Easy Burger Recipes. There’s the perfect recipe for everyone! Burgers are a staple of summer for us. Whether we’re grabbing a package of pre-made patties or I’m making my own, we make a lot of burgers. So I like to experiment! Plain old cheese and a pickle gets pretty boring. 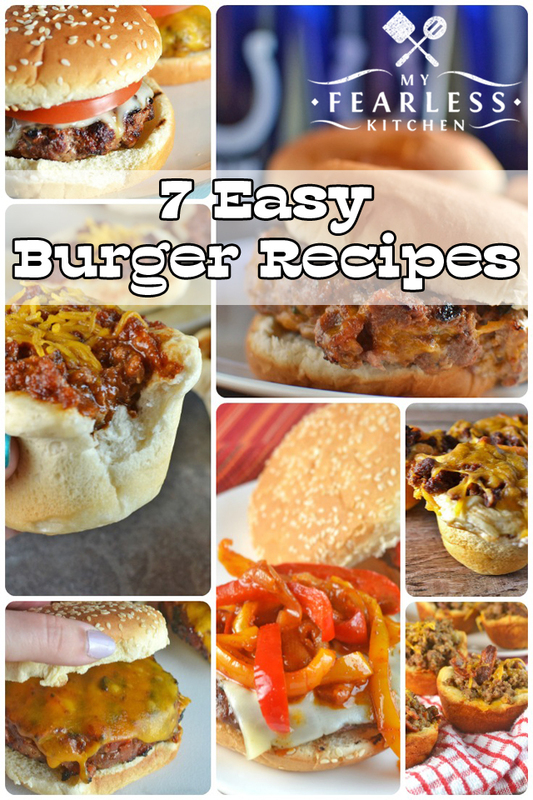 Check out these 7 Easy Burger Recipes, and pick a new favorite! You can’t go wrong by throwing a burger on the grill. These Hand-Pattied Hamburgers are the perfect “basic” burger. Dress them up any way you like! We love Cheddar Bacon Ranch Burgers and BBQ-Bacon Cheeseburgers – because everything is better with bacon! These Fajita Cheeseburgers are a great way to fancy up a plain burger. I use this burger press from Cuisinart to get perfect patties, every time. Grilled burgers are a staple of summer, but sometimes you just need to switch it up a little. Cheeseburger Cups are perfect for little hands – and they are fun for grown-ups to eat, too! Add lots of barbecue sauce for these BBQ Cheeseburger Cups. And bring on the bacon again! I know you’ll love these Bacon-Ranch Cheeseburger Cups! You’ll need a good muffin pan for cheeseburger cups. I like this one by Wilton. Which one are you going to try first?! ?